Ahi poke (pronounced “POH-keh”) is a classic Hawaiian food. I love making ahi poke in the summertime, because it's nice and cool. No need to heat up the oven! And it's my husband's absolute favorite. 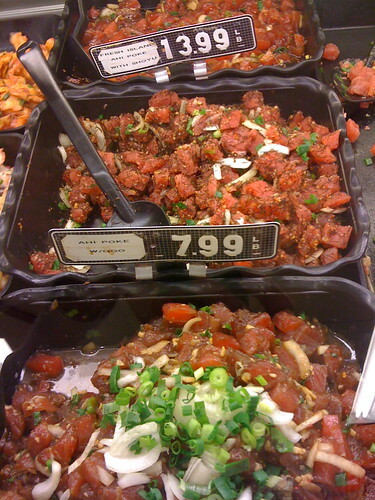 Because poke is served raw, it's chock full of enzymes, which are very important for nutrition. An analysis of 20 studies involving hundreds of thousands of participants indicates that eating approximately one to two 3-ounce servings of fatty fish a week—salmon, herring, mackerel, anchovies, or sardines—reduces the risk of dying from heart disease by 36 percent. I've only been to Hawaii twice in my life. Both times, I absolutely loved it. The first time was almost 15 years ago, when I went to the Big Island. Recently I visited Maui with my husband. Click here to read about the food we ate on our trip. Instead of a salad bar, they have a poke bar at their supermarket! Not only is Hawaii beautiful, but I was struck by how well we ate when we were there. We had fresh, wild seafood two to three times a day. Fish is often eaten raw or very lightly cooked. Coconut is incorporated in many of the meals. Of course, there's a lot of bad food in Hawaii, too. MSG is used at many restaurants. So are trans-fat-laden hydrogenated vegetable oils. If you eat at the fancier restaurants, you can avoid much of these industrial fake foods. But if you cook Hawaiian food at home, you can avoid all of them. 1. Toast the sesame seeds in a small dry pan over low-medium heat on the stove until fragrant and golden, several minutes. Remove from heat and set aside. 2. Cut the ahi steaks into bite-sized cubes. Transfer to a large freezer bag, or you can use a mixing bowl. 3. Add the soy sauce or fermented fish sauce. 4. Chop the green onion and Maui onion — about 1/4 cup of each. Add to the bag. 5. Peel the knob of ginger with a vegetable peeler. Grate 1 teaspoon and add to the bag. 6. Add the sesame oil and the toasted sesame seeds. 7. Mix all the ingredients together. Refrigerate for at least 2 hours and up to 4 hours before serving. 8. When ready to serve, taste and season with sea salt as necessary. Awesome stuff! I make it regularly. My recipe is almost identical. I hadn’t been putting ginger in, although it sounds good, so I will try it. I also mix in a diced avocado. Heavenly! I just had lunch, but I’m salivating just the same- sounds delicious. This recipes looks delicious. Once I figure out were to get sushi grade fish. I’m definitely going to make it. This brings back memories of my military years in Hawaii. Ahe Poke was my fav of all the local foods. I’ll be looking for some fresh ahi this weekend for sure. While I’m at it, maybe I should dig a hole in the backyard and roast a pig! WOW – I never knew such a thing even existed. I LOVE raw Ahi tuna – when we get sushi, I always order a bunch! That looks so very YUMMY!!! So – the million dollar question: Where, in central Indiana, would I even begin to start looking for Sushi-Grade Tuna? I’d probably have this every day for lunch if I knew where to find the fish. Any ideas? Made this just now–awesome! Just like we had in Hawaii.